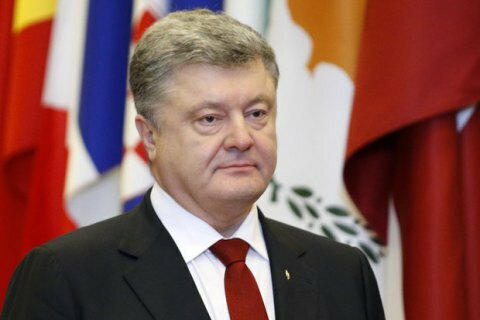 Poroshenko's office says Georgian leak "fake"
In the leaked document Poroshenko allegedly promised not to act against Russia. The Ukrainian presidential administration has described the "documents" allegedly written by Petro Poroshenko, which were published by the Georgian TV company Rustavi-2 yesterday, as "a low-quality fabrication and a fake manufactured and leaked to Rustavi 2 by the Russian special service". "The press service of the presidential administration is calling on the media not to share fake information, which was clearly ordered by the aggressor state. And as for the media which reported unverified information, in particular, Ukrayinska Pravda and Newsone, we expect a public apology," the press service said in a statement. On 13 January, the Georgian TV channel Rustavi-2 published scans of what the channel described as Petro Poroshenko's "appeal" to the Russia Federal Security Service (FSB), dated February 2007. In them, Poroshenko allegedly promises not to act "against the interests of Russia." On 3 February 2007, Poroshenko, who was a Ukrainian MP at the time, was not allowed into Russia. The Russian Foreign Ministry said then that the entry ban was in response to an "unfriendly step by the Ukrainian side". The scans that Rustavi-2 described as "the appeal to the FSB" say that the entry ban was unfounded since Poroshenko "has nothing to do with the anti-Russian campaign of [then President Viktor] Yushchenko, instead he acts in the interests of Russia by attracting big investment and creating jobs for Russians" and that "he is one of the founders of the Party of Regions". According to the "documents" leaked by Rustavi also say that Poroshenko regularly visited St Petersburg where "the parents of my son Oleksiy's wife live". However, Oleksiy Poroshenko did not marry Russian national Yuliya Alikhanova before 2013, which also puts the authenticity of these papers in doubt. The Georgian TV channel Rustavi-2 is one of the most popular Georgian media. The "leak" about Poroshenko is one of the most popular articles on its website at the moment. Some of the comments under the article were made by representatives of the Ukrainian Movement of New Forces of Mikheil Saakashvili who is at loggerheads with Poroshenko. When Saakashvili was Georgian president, the TV channel followed a pro-government stance and still continues to support the ex-president. It is critical of the current Georgian authorities.